You know what game was a lot of fun? 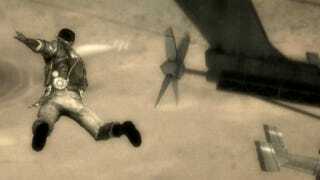 Just Cause 2. But as delightful as it was, it had more than its share of flaws. So, you know what game will probably be really fun? Just Cause 3. And this image shared by Avalanche head Christofer Sundberg on Instagram suuuure looks like a new Just Cause game. That sure looks like a plane, and that guy sure looks like Rico Rodriguez. Avalanche has several games in development at the moment; Kotaku's resident investigator Superannuation believes that one, code-named "Project Mamba," is likely a new Just Cause. Sundberg recently tweeted another blurry image that also looked like a new Just Cause game, and this new airborne shot seems to reinforce that theory. His description of the image remains cryptic: "Is it a bird? Is it a plane? #yearoftheavalanche #avalanchestudios." First of all: No, it's not a bird. Yes, it's a plane! Well, or a blimp or something. But is this a shot of Just Cause 3? Or some other Avalanche game that simply has a very similar look? And if it is a new Just Cause, does it mean that Just Cause 3 might take place somewhere with a desert? That'd be cool by me. We may not know yet, but it seems likely that we'll find out soon.